Thanks to Poplight and to Aftonbladet, here is the line-up of guests for the new season of Lotta på Liseberg which starts on 20th June on TV4. 20/6 Alexander Rybak, Orup, Loa Falkman, Sanna Nielsen. 27/6 Christer Sjögren, Thomas Di Leva, Ola, Jörgen Mörnbäck. 4/7 Malena Ernman, The Poodles, Swingfly feat Pauline. 11/7 Jessica Andersson, Charlotte Perrelli, Linda Pritchard, Alcazar. 18/7 Jenny Silver, Jack Vreeswijk, Ann-Louise Hansson, Josefin Glenmark, Brolle. 25/7 Lill Lindfors, Ulrik Munther, Martin Rolinski. 1/8 Danny, Arja Saijonmaa, A Friend in London, Paradise Oskar, Stella Mwangi. 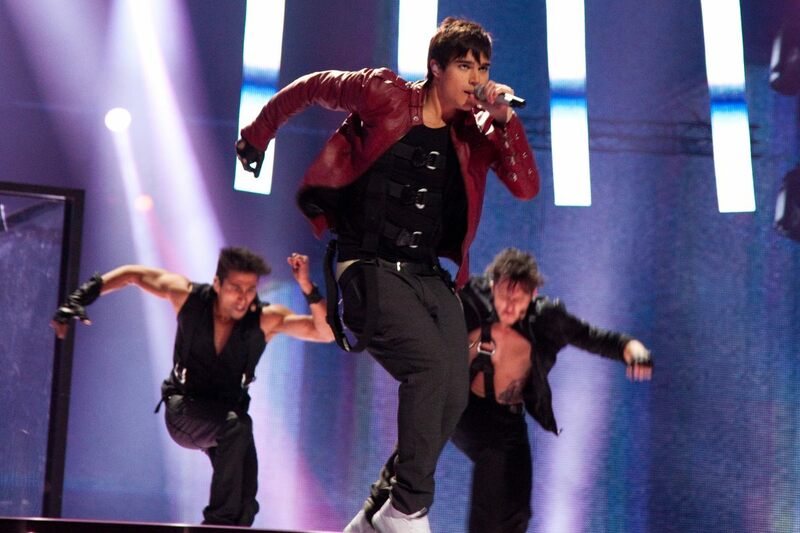 8/8 Eric Saade, Tomas Ledin, Thomas Pettersson, September. A pretty impressive line-up - and I'm particularly looking forward to seeing Martin Rolinski as he launches his career as a solo artist. My original blogging plan for 2011 was one month off, two months on. This has worked quite well so far, however I'm changing it slightly over the summer. Instead of blogging through June and taking July off, I'm going to take at least the next two weeks off and see how it goes. There will of course be coverage of this summer's big Swedish TV event - Allsång på Skansen which starts on SVT on 28th June and runs through till 16th August - more news to follow about this year's artists, and of course all eyes will be on Måns Zelmerlöw in his first year as presenter of the show. Lotta på Liseberg is also back on 20th June so I'll write about that too - Le Kid will be performing with Orup on that date so that's something to look forward to. This blog will return on 14th June, but there will of course be the occasional post between now and then! Higher - Taio Cruz & Kylie Minogue: Yes I know I was late to this one, but it's one of the best things he's done in ages and not even the hideous Travie McCoy can spoil it. Walking In The Rain - Flash & The Pan: a forgotten old obscure gem restored to my memory thanks to it being used in a car ad. Without You/Walking On A Dream - Empire of the Sun: rediscovering them once again. Actually, forget that, because I never stopped listening to them. Don't Know Why - Soundgirl: very clever use of Carly Simon's "Why" sample. It's got 'summer hit' written all over it: now all we need is the weather. All the songs I played after Eurovision was over. Lifeline - Jamiroquai: heard it a lot in Pisa and realised I liked it more than I initially did. Indestructible/Hang With Me - Robyn: still liking these. Give A Little - Hanson: ooh look they've grown up into big grown-up men now!! This is a nice catchy pop song. Bullets - Rebecca & Fiona: no, I'm still not tired of this one. Another beautiful morning in Pisa. For some reason there's been a demonstration going on, lots of red flags and drumming. It's all very peaceful despite the police presence. (Faithful travelling companion's done his research and it would appear that it would really be revolutionary to have a cappuccino after 12.00 noon in Italy. It may be etiquette, but I don't like it: few things beat a late-afternoon cappuccino on holiday). Today's piece of gratuitous food photography comes from the window of Pasticceria Salza in Borgo Stretto. There are fruit tarts and there are Salza fruit tarts. Pretty awesome....and with a pretty awesome price tag to match. 22 euros for a cake!!!!! For lunch, it's back to our favourite pizzeria on Borgo Stretto. This is currently my wallpaper/background on my computer at work: you will probably wonder....why is she torturing herself so much???? A question which I cannot answer. Just enjoy the porcini mushroom topping. Today's just about hanging out and visiting which have become old haunts by now. Needless to say the Piazza dei Miracoli gets another visit. There's something which keeps pulling us back there, and in the absence of any squares/green spaces, it's probably the main gathering-place in the city. There's also a chance to pick up some more last-minute souvenirs too: I particularly love those Venetian masks which I remembered being on sale at unaffordable prices in a shop in Nice - but they are a lot more affordable in Pisa, and you get them in all shapes and sizes. I buy a smaller one (pictured below) which is now hanging on my bedroom wall. Lots of wooden Pinocchio souvenirs on sale here too, so needless to say we buy these too. The heat and the shopping has worked up our thirst for some gelato. I love lemon ice cream!!! After our afternoon adventures we go back to get ready for tonight's meal. We dine out at a wonderful little pizzeria where you can watch the chef preparing the pizzas for cooking in the wood-fired oven. We don't have pizza though - one per day is enough!! - but there are more porcini mushrooms, this time in my pasta. I'm getting a taste for this delicious treat. After dinner we end up back at "student square" for one last time. It may be Friday night, and lots of young people are drinking....but no-one's getting drunk, no-one's fighting, and it always feels safe. Pisa's a great little city and we've had a lovely holiday. Nothing much to write about Saturday, as we spent most of it travelling home. Took a bus to the airport (10 minute journey) and then eventually left the sun behind, returning home to the usual dark clouds and heavy rain. So, would I recommend Pisa for a short city break? The answer is a definite YES! Especially if you want a relaxing few days - and it's also a great base for exploring other parts of Tuscany too, if you want to include some day trips in your itinerary. 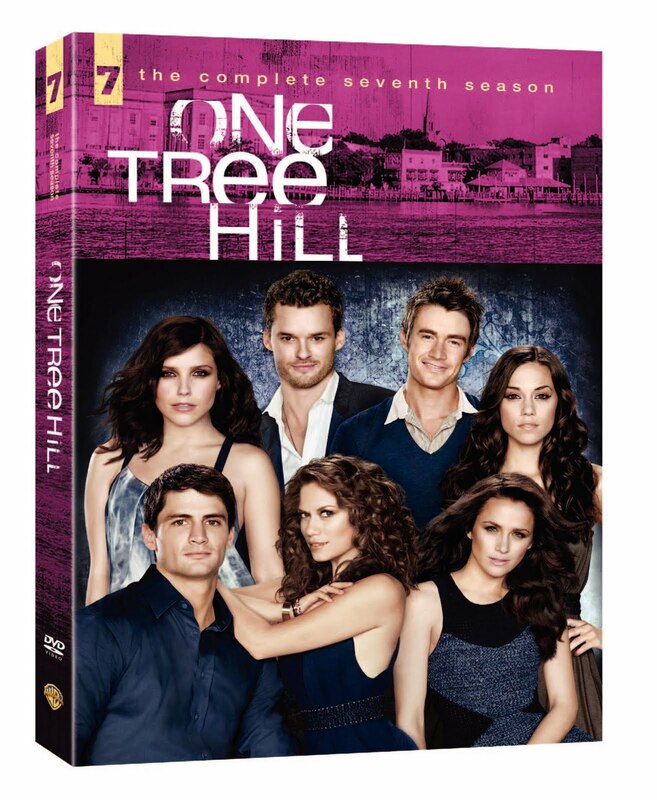 Over the last few months I've been working my way through each series of "ONE TREE HILL" and have finally made it to Season 7. In Friends-speak, it's "The One Without Two Original Major Characters" (I won't spoil it for anyone in the world who hasn't seen it yet). I particularly miss that female character, as she was my favourite in the show. Anyway there are some new characters joined the show, but they don't seem as interesting as the ones who have left, and the whole style of the show seemed to have morphed into 'the beautiful and the bitchy' style of many other American TV shows featuring younger characters. 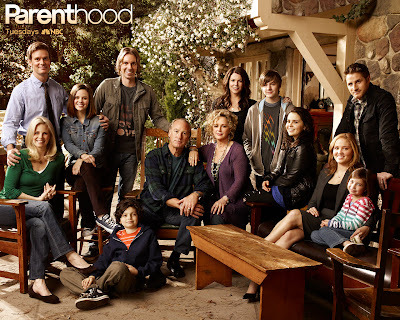 I still enjoy the show, but it seems to have lost the emotion and the heart which made it so special in the first place. Although it’s still very addictive nevertheless, and I can’t wait for season 8 which will be back on E4 in June. Talking of BBC4 and Nordic stuff, they’ve started re-runs of the Krister Henriksson season two of "WALLANDER" which, of course, is well worth watching all over again. I may or may not have said before on here that "WHO DARES WINS", (BBC-1) Nick Knowles' game show which is connected to the Saturday night National Lottery draw, is my favourite game show on the telly. Only because it's not a stupid celebrity panel game, or some stupid incomprehensible psychological nonsense, it’s just guessing lists. However the down side is that the same contestant duos seem to stick around for ever - the current Nat & Euan for example - but at least they’re not as irritating as previous contestant Adam "COME ON!!!!" who was briefly the most annoying man on television. 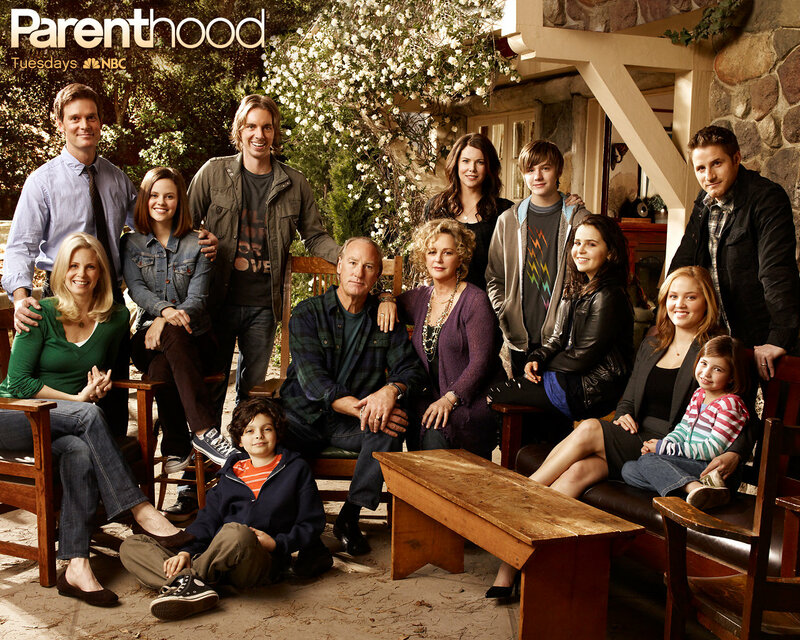 I’m enjoying season one of "PARENTHOOD" (5*) if only for the reason that Lauren Graham is in it, and I love, love, loved her as Lorelai in Gilmore Girls. She’s playing a similar independent, quirky character and is my favourite here too. It’s just a simple, straightforward, family drama which is a nice change from all the cops, hospitals and sci-fi. It’s very well cast, and could probably go on for at least another six seasons (it’s tipped to return for a third season in the States). Just one minor irritation for me: the personality-free zone that is Peter Krause. But that’s maybe just the character he’s playing, I don’t know, as I haven’t seen him in anything else. One particular strength that American TV series seem to have over our homegrown counterparts is an ability to go on and on and on, and maintain a very high standard along the way. "GREY'S ANATOMY" (Sky Living) has had its shark-jumping moments over the years but on the whole it remains very addictive viewing, even if the often ridiculous relationship merry-go-round has you shaking your head in disbelief. 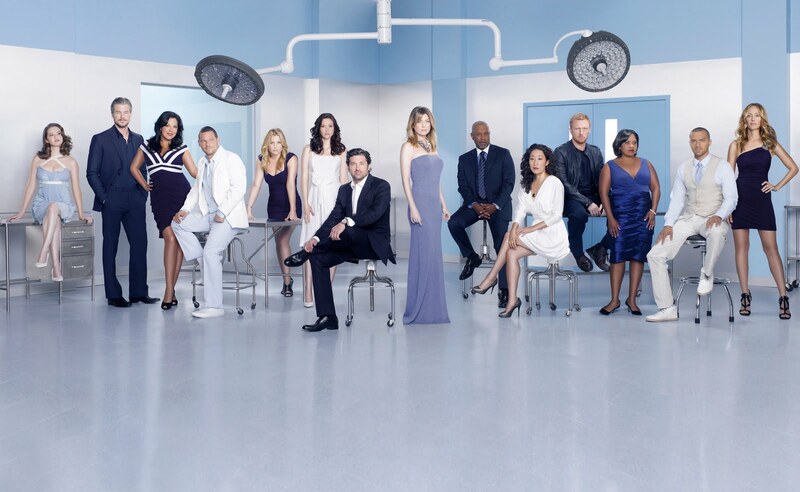 Season 7 has been more satisfying than frustrating, with the focus on the reunited Callie and Arizona, Meredith and Derek's medical dilemma, and some nice side plots. Good news - it's been renewed for another season, however I’ve read various articles on showbiz sites which suggest that it could be the last one for the series’ major characters...? So enjoy it while you can! "FAIRLY LEGAL" (Universal Channel) is a nice, lightweight, undemanding way to pass an hour. You won't be surprised to learn that it's yet another American drama import, about Kate, a legal mediator. There's not much else to it really, but it's light-hearted fun. Yes it’s been renewed for a second season - hope we get to see it. 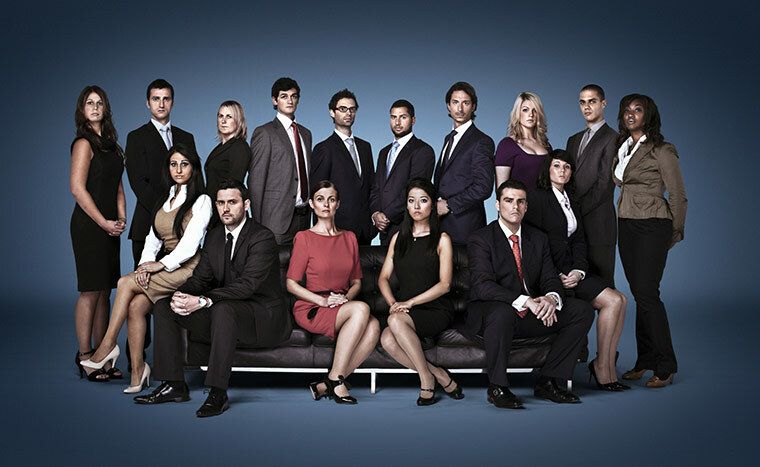 "THE APPRENTICE" (BBC1) is back again - and whilst there’s no Baggs The Brand this time round, there’s always an opportunity for posh wannabes to make fools of themselves. 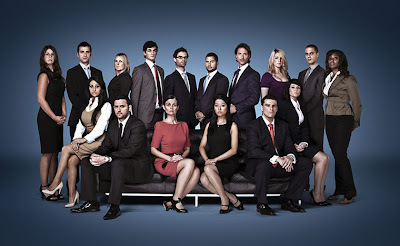 And that’s the real reason we watch it of course - to see them taken down several pegs by Lord Sugar. By the way, you can follow "Siralan" on Twitter - http://twitter.com/Lord_Sugar - loving his 'feud' with "Piersy"!! It's a bright, sunny, and slightly breezy morning - perfect conditions for heading out to the coast. As with many other European cities, it's very easy to use the train ticket machine, as it also had instructions in English - I often wonder how non-English speakers would cope with a similar situation in the UK? It must be very difficult. Today's destination is the seaside town of Viareggio, precisely 21 minutes' train journey from Pisa Centrale. And the train journey through the Tuscan countryside is a treat: it's Tuscany in a nutshell, with those trademark narrow triangular trees, vineyards and mountains along the way. On arrival it's quite a long slow walk from the station to the 'prom' (not that those chic Italians would call it that of course!) and the most noticeable thing is that....you can't see the sea, for most of that long promenade, and for much of it the beach seems to be only accessible through private beach clubs etc. But we find a way, and later discover that there is a central section of the prom with a whole sea view. Viareggio has some fascinating architectural gems on its promenade and is well worth a visit. Going in May means there's definitely a more off-season feel, but it didn't spoil an enjoyable day. After lunch we head on down to the other end of the prom, past some very classy shops indeed, with the Jimmy Choo shoes and the posh designer jewellery in the windows. You can't buy much though: even the millionaires would go home empty handed if you're trying to shop here between 1.00 and 4.00 pm. Just as in Pisa, the shops are closed for a very long lunch break between those hours. We do manage to buy something we can afford though....gelato. Yum! It's very hot today - the hottest day of the holiday so far, but that's not a problem. The pace is still relaxing and slow...then we head back to the city and back to the hotel to get ready for another night out. Pisa is very well situated with regards to transport and is in easy reach of other cities, namely Lucca and Florence, which we'd probably visit if we were to return to Pisa for another break in the future. Dining out at yet another one of those restaurants on Via Santa Maria. Which meant for me another variation on Tuscan Bean Soup. And finally plucking up the courage to ask the question: "can I order two things from the primi piatti"? I worried about the breach of etiquette, the potential culinary faux-pas etc etc. As it turned out this was ok and they said yes, so I didn't need to go into my "I'm almost vegetarian and the only meat I eat is chicken but you don't have any on the menu...." routine. Breathes a sigh of relief. Typical Thursday night: like everywhere else, there are a lot more people out tonight and the bars/restaurants are all much busier. Tonight is cooler than last night, or our location - down at a riverside bar with the accompanying cool breezes - may have something to do with it. We're not in 'student square' as I call it, but ....well, another version of it, at the Piazza Garibaldi which seems, like a lot of other parts of the city, to have separate day/night identities. You'll get bars/restaurants which open during the day but not at night, and vice versa, which is a bit unusual. Or maybe it's just because it's not summer yet? The day starts with a little rain, which thankfully doesn't last. However just to be on the safe side, I take my light anorak out with me but end up having to carry it around during what turns out to be a warm day. Having discovered the north side of the river, we cross the Ponte di Mezzo to the other side. Which takes us straight onto the Corso Italia which is the city's main shopping street, where you can find lots of Italian/European chain stores....and Galleria Del Disco, which is a small but well-stocked CD and DVD store. We walk as far as the railway station and then make our way back to Borgo Stretto for lunch at a fab little pizzeria, where I encounter the best pizza I've ever tasted in my life. It's called a Pizza Pinoccoli, it has walnuts, pine nuts and truffle oil, and here is a picture of it. After that divine lunch it's time to return to the Piazza dei Miracoli to see that tower again (and all those other lovely buildings) in daytime and all its full tourist glory. People-watching is great fun here. What amazes me is how anyone would want to climb up all those stairs to the top of the Leaning Tower...but they do! (We most definitely don't). There is a lot of building work going on all over Pisa at the moment - notably on the Corso Italia, which is being resurfaced, the Piazza Vittorio Emanuele and in various other parts of the city. But there are some very distinctive and beautiful buildings to look at, like this one which is on the big square not too far from our hotel. Pisa is a great city to just hang out in. Because it's so walkable, the pace of our holiday has been slowed right down to a level of relaxation which we're not really used to. No dashing from one metro station to another. One particularly nice and unexpected thing is that the drivers aren't as manic as I thought: they actually stop at the red lights and let you cross the road! Dinner tonight at one of the tourist-friendly restaurants on Via Santa Maria. Anyone for gnocchi al pesto? Following dinner, we hit the road and head for Piazza delle Vettovaglie. By day it's a market square, but by night it is transformed into student-land with lots of cheap bars and eateries all round the perimeter. There's a great buzzing vibe and we enjoyed it so much last night we're back again. Despite being "over-age" we get a very warm welcome. Pisa is a very friendly city indeed. Anyway, in the interest of research, we need to try some Sardinian beer: the cheap and cheerful and very popular Ichnusa! 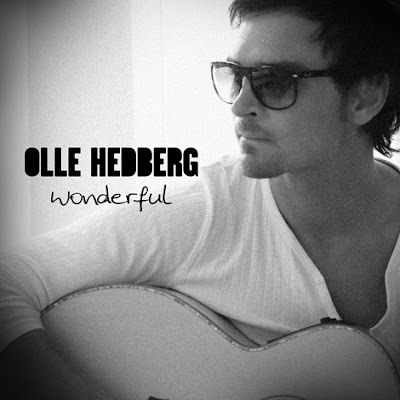 Last autumn, regular readers of this blog will remember that Olle Hedberg was my favourite contestant on Swedish Idol. Now he's released his debut single, "Wonderful", which is a cover version of a song released a couple of years ago by British singer-songwriter Gary Go, which got a lot of radio airplay over here two years ago. The song has been used in various movie soundtracks and most recently it was played during the interval of this year's Eurovision Song Contest final (when the televoting phone numbers were displayed on screen). So there's still a lot of life left in the song, and who better than Olle to keep it going? "Wonderful" was released yesterday and is already no.15 in the iTunes Sweden singles chart. Check out Olle's official site http://www.ollehedberg.com/ and Facebook page http://www.facebook.com/pages/Olle-Hedberg/119189471447567 and of course don't forget to check out his various great cover versions over at YouTube. Or not, as the case may be. Because this holiday was booked at very short notice it meant that I had very little time to familiarise myself with the latest Italian hits, therefore couldn't really identify them from what I heard on the radio. There was one song (in Italian) which I liked, and which got a lot of airplay, but which I still don't know the title of. (I recorded a clip of it on my phone so I'll maybe put this in a separate post). It's like a guitar band pop/rock song, then goes into rapping on the chorus. Another song which turned up regularly on the radio was "Eh...già" by Vasco Rossi which I did remember from the Italian charts update on this blog, and one of this year's Sanremo songs, "Arrivera" by Moda featuring Emma, was another regular radio fixture. I finally tracked down an Italian music station, Radio Italia ('solo musica Italiana') and heard lots of nice Italian pop tunes there. Significantly, despite their return to Eurovision after 14 years, I didn't hear Raphael Gualazzi once on the radio. Stepping off the plane, mid-morning in Pisa, and having left a very, very chilly morning behind, it's a welcome opportunity to remind ourselves what good weather is like. The close proximity of Pisa airport to the city centre is a major selling point, and it's only minutes away. On the journey from the airport there are lots of terracotta-coloured buildings, dark green shutters and clothes hanging out on the balcony to dry. Welcome to Italy! And we're so happy to be here. Pisa is split into two halves by the River Arno. North of the river is where it all happens - not only the obvious tourist attractions, but also lots of bars and restaurants competitively priced to attract the massive local student population. Pisa is a university city, and there are a number of university buildings in the various streets nearby. As a result, it's also a very young city. One more thing - Pisa is compact and walkable, however the city planners seemed to have a bit of a disregard for pavements, which are very narrow, so you need to watch out for that scooter - owww! Yes it would appear that Pisa is living up to that Italian scooter-owning stereotype, but maybe one lesser known fact is that it could be the "Amsterdam of the South" - everyone seems to own a bicycle! Surprisingly, finding somewhere to eat lunch is proving to be a tougher challenge than we thought, but this is more to do with not looking in the right places. Of course, as we discover Pisa over the next few days, there are no problems finding a place to eat, and many of the restaurants in the vicinity are all competing for tourists and offer some surprisingly affordable meal-deals. One of my misconceptions was that Italy would be unaffordable, but the price of a meal and drinks can actually be cheaper here than at home. Later in the afternoon we make our way to the city's best known tourist attraction. The first thing you notice about the Leaning Tower is that....it doesn't lean at all. Only joking! But that's actually true if you approach the tower from a certain angle. ....and the Baptistry is another design feast for the eyes. All the souvenir stalls are all in a row, along one side of the square, and of course there's plenty of top tourist tack - Leaning Towers big and small, leaning cups, leaning glasses, chefs hats and aprons, rude boxer shorts (! ), football tops, Venetian masks etc. There are very few souvenir shops in the city centre so this is the place to go if you want to buy all your Pisa goodies. There are lots of restaurants to choose from on Via Santa Maria, which runs all the way from the Piazza dei Miracoli down to the river. Before this holiday, which was booked at very short notice, I was worried about not knowing any of the Italian language. Happily, all menus seem to be in English too, and some Italian words seem more familiar than I first thought. Faithful travelling companion had actually made the effort to learn the language and, as usual, did very well. Italian menus seem very different from those at home. Pasta is not a main meal, but it's primi piatti then you go on to the main course which is usually a meat or fish dish. One local treat is Tuscan bean soup, so this is a first night primi piatti must-have, and it doesn't disappoint. After dinner we head in search of a bar and uncover a hidden treat. But that's for another instalment of the Pisa Diaries....day 2 coming soon! So, what's been the outcome of Eurovision 2011 then? But even in Sweden = arguably the most receptive country to all thing ESC, it's been a surprisingly un-receptive post-ESC week in the Sverige Topplistan, with only Eric Saade climbing back to no.17 with his 3rd placed "Popular" with Jedward's "Lipstick" closely following at no.18. Oh, and no trace of Swedish-written winners Ell and Nikki. Over in the German iTunes chart we find a certain pair of Irish twins at no.1 in the singles chart, with Blue's "I Can" at no.17, A Friend In London's "New Tomorrow" at no. 20, and Stefan Raab's rockabilly version of "Satellite" at no.35. In Denmark's iTunes chart, A Friend In London are at no.11 with no other ESC songs in sight, whilst in Norway the highest-placed song is Stella Mwangi's "Haba Haba" at no.30. Finally, it's no surprise to see little evidence of ESC in the UK iTunes singles chart, with Blue slipped to no.60, Jedward at no.93. A record-breaking day for this blog! Yesterday was indeed a record-breaking day for EuropeCrazy - over 1200 visitors so thank you all! I guess those high numbers had something to do with a certain song contest taking place perhaps??? I noticed there were lots of searches for Eric Saade so if this blog is to remain "popular" then I guess I'll have to keep the Eric news coming!! Thanks once again to all of you for visiting - much appreciated - and don't forget to visit this blog again soon! EuropeCrazy presents: The 2011 Eurovision final. Firstly, the commentator: thank goodness it's Graham Norton and not those BBC3 clowns. The venue: it's a converted football stadium in Dusseldorf, with the world's biggest LED screen behind the performers. These days Eurovision is big in every way, but that's not always a good thing. During the semi-finals I found the big-screen backdrop to be hugely distracting at times, and some acts used it much better than others. The presenters: as in the semi-final, there were three of them. Anke Engelke, Judith Rakers, and Stefan Raab. Probably one presenter too many, as I didn't really see the point of Judith. Graham Norton called him 'Dusseldorf's Simon Cowell' although I see him more as Germany's Jonathan Ross. Or how about this description: Germany's one-man personality cult who seems to think he is at least as big, if not bigger, than the contest. As if you needed an example, look no further than the opening act. The previous year's winner would usually reprise their winning song, but not this time ....nope, the Stefan Raab show is underway, and he's 'performing' a rockabilly version of "Satellite" - maybe it's my Freeview where the mouths don't go at the same time as the music, or is he just miming badly? Yes he's milking the moment for all it's worth and thinking of all the iTunes downloads he's gonna get. Oh look! There's 43 Lena lookalikes....and finally the real one to finish it all off. Mum: If they'd done that version last year it wouldn't have won anything! Laura: These presenters are annoying me already. Again. M: when's the show going to start? M: This has got a good chance. I quite like this now on second listen. It's actually better when you listen to it without having to look at his smug face. 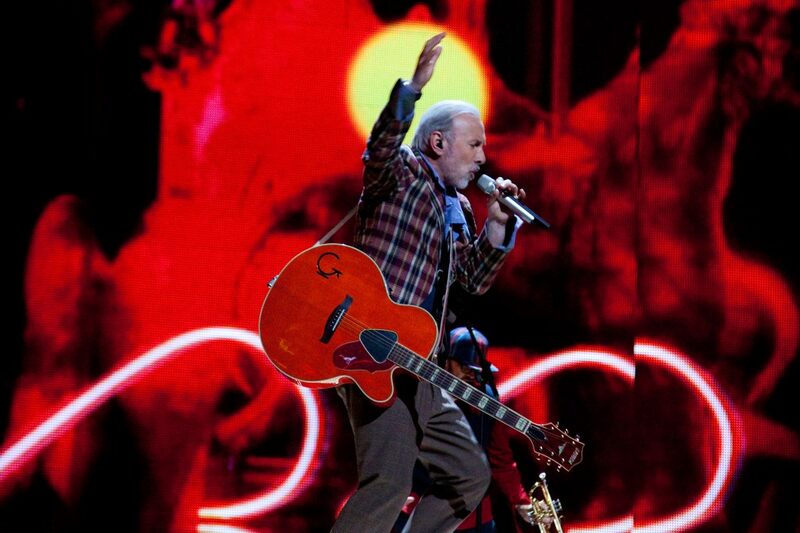 Bosnia-Herzegovina: "Love In Rewind" - Dino Merlin. L: That trumpet player's very annoying. M: If that doesn't win I'll put a brick through the telly. This is great! (Mum had never heard "Love In Rewind" before the final). L: I like this and it was one of the main faves, but the draw has probably killed its chances dead. Which is a shame. L: I'll need to check out their other songs after the contest. M: Oh yes I remember this. It's not bad. L: I like the way he's using the catwalk. This is not bad at all. This is the one that sounds like "Sing For Me". L: This is my first toilet break of the evening. M: The sign language is commendable but the song's rubbish. This will probably come last. Absolute rubbish. Hungary: "What About My Dreams?" - Kati Wolf. We are both agreed that the styling is terrible. Basically she's wrapped in blue satin, and it's not a good look. M: She's wearing a cupcake on her finger. L: What about that ring? I think the problem with this song is that the verses are very poor and only the chorus is selling it. Trust me on this one: whether or not this wins, it will probably emerge from this year's ESC as the major hit song of the competition. Here I come, here I come, dum-da-dum-da-dum-da-dum. L: They are going to do very well. M: Yes they will. That's fine. L: The backing singers are still doing most of the work. M: Oh he's a nice looking young man. Best looking guy tonight. L: reminds mum about 'Manboy'. M: Oh was that him? I remember him now, I like him. The glass breaks, and Eric emerges triumphant. The backing vocals work. L: goes into a commentary about Eric's debut last year, and even throw in a gratuitous mention of Danny Saucedo for no reason at all. Estonia: "Rockefeller Street" - Getter Jaani. M: Is she singing live? Because you can't sing live and dance like that too. L: Believe me, she's singing live - and not that well either. M: It (styling) is a bit like Alice In Wonderland. I've heard worse. L: This was one of the pre-contest faves till she opened her mouth. Gratuitously Greek backdrop, dramatic singing and a rap. L: It's very different and dramatic but I'm bored with it now. M: Oh that's that guy! (Loukas). Russia: "Get You" - Alexey Vorobyov. M: There's nothing wrong with his singing, I just don't like the song. L: I like it. Don't like the lighted jackets though. It seems to have lost something, can't put my finger on it, but I'm not so confident about its chances anymore. Pre-contest massive favourite. A great big opera song sung by a young tenor with a big voice. This really threatened to overwhelm everything else....until he started singing. L: Staging is good but he is totally off key. This isn't working. M: I don't like it. Really not my cup of tea and I like some opera songs but this isn't a good one. L: Can't see it making a connection with the voters. (we then spend the remainder of the song talking about Corsica). The overhead camera shots of the piano keys only reminded me of the same camera angle on Salem Al Fakir's "Keep On Walking" in Melodifestivalen 2010. Just thought I'd mention that. M: So Italy's back then! They've been away a while. L: It's still a big ??????????????????? for me. I don't know what to make of it. M: That screaming - usually Italy's Eurovision songs are very melodic. L: Very odd. But I'm swaying and waving my hands in the air. Switzerland: "In Love For A While" - Anna Rossinelli. Poor staging - whose idea was it to mix blue and green? And who designed those awful suits? Blue are not going to win this and could end up doing much worse than predicted. The song is far too reliant on Lee hitting the high notes, and it's not working. M: I can't, I won't. I'm not impressed. L: Neither am I. Those outfits are terrible. Probably their best performance, better than the rehearsals but that's not saying much. Moldova: "So Lucky" - Zdob si Zdub. L: I'm really liking this now, and it's not just the Cava to blame. M: This is mental. It's like the way Eurovision used to be. Those flashing lights are going to give me a migraine though. Very amusing though. Crazy hats. Great staging but that's not too surprising, they're the host country after all! Lena gives an intense and very un-Eurovisiony performance. M: She looks totally different. L: Yes she's really grown up now. M: Don't know if this will do so well. Don't know about this. L: I think it will do quite well, but not a winner. That's all the half decent songs out the way - it gets a bit pants from now on. Romania: "Change" - Hotel FM. M: What's a British guy doing singing for Romania then? L: He went over to build orphanages and stayed. M: It's the trousers...the problem's the trousers. L: He can't change. But I wish he'd change the trousers, they're so wrong. But this is a better performance than in the semi-final. M: He looks like a comedy act. Or 'Nadine Belter' as she should be renamed, with that big voice. I guess if those showstopping ballads are your thing, then this was probably the best one of the night. Lots of cheering from the audience. We both spend the duration of the song discussing her shoes and debating about whether her hair is a wig or not...we decide it must be a wig. It's just too perfect. Azerbaijan: "Running Scared" - Ell & Nikki. Or Ell/Nikki as they are billed on screen. M: It's a load of tripe. L: It's nice enough, pleasant enough but doesn't strike me as a winner, and it's still not doing it for me. And they still look so mismatched. M: Boring. Don't like this at all. Slovenia: "No One" - Maja Keuc. M: Shouty woman. A full song of shouting. L: It's the Christina Aguilera fan club, Slovenian branch. My Cava is running low already...some of these later songs would drive you to drink. Iceland: "Coming Home" - Sjonni's Friends. Still a major thumbs up at EuropeCrazy HQ and as near to our united tolv poäng as we're going to get. Mum is singing along with the chorus. L: I still like this very much. M: Very nice, simple song. A merry little ditty. L: Any thoughts on winners? M: It's probably someone we won't agree with. L: Strangely enough I've enjoyed this final much more than I thought I would....it's a bad year, but results-wise it's wide open. M: discusses when Cliff Richard was beaten by Massiel in 1968. L: I used to like when the Spanish singer came from Operacion Triunfo. M: I don't like this much, it's mediocre. L: I wish David Bisbal would represent Spain at Eurovision one day. Ukraine: "Angel" - Mika Newton. L: Ukraine always does very well. M: You shouldn't vote for the country, you should vote for the song. L: And extreme gimmicks should be banned. M: All that stuff going on in the background is to make you forget how bad the song is. L: Zzzzzzzz....this is rubbish. I want Verka back. M: She should have used those feathers to fly away. L: breaks into spontaneous outburst of cheesy 60s dancing. L: Where can I get those green tights? M: No one had tights that colour in the 60s. People wore stockings, and empire line frocks. M: It's just all shouting and screaming. L: I preferred their semi-final performance of this. M: Hate those flashing lights. And then that was the end of the songs, followed by what felt like about half an hour of reprises. And was that Gary Go being played over one of the reprises? Totally random! Onwards to the interval act, Jan Delay and his band Disko No.1. Who in retrospect I can't really remember much about, apart from him rapping/singing "Klar" which I remember and liked a lot, during a previous holiday in Germany. Graham Norton called it 'underwhelming' and I can see where he was coming from. It wasn't Riverdance, it wasn't Glow...it just wasn't iconic enough I guess. But credit to them for a lively enough performance anyway. Aww it's the old ESC logo :) And Raab's playing guitar again. Let's get to the voting, chappies!! Bulgaria - 12 to UK! Italy - 12 to Romania and 10 to UK - believe it or not, the UK is top of the scoreboard at this point! Cyprus - 12 to Greece (!) No, surely not????? Ukraine - 12 to Georgia. And hasn't Ruslana aged? Norway - 12 to Finland. And totally ignored Denmark! Slovakia - 12 to Ukraine (why all the love for Ukraine's song? I can't remember it). Austria - 12 to Bosnia-Herzegovina. At this point, Sweden lead, Azerbaijan 2nd, Ukraine 3rd, and Ireland 4th. Germany - 12 to Austria. Got some real neighbourly love going on tonight. Azerbaijan leading at this point. Don't know why, but not too surprised that they are. The votes are so spread out that it's not going to be a unanimous, runaway winner this year. Sweden now leading! Extreme yay! I may never have been the biggest fan of "Popular" but the idea of the contest going back to Sweden....yes please. Slovenia - 12 to Bosnia-Herzegovina. It's 10.55, there's no sign of the show ending and Eric needs the loo. Turkey - 12 to Azerbaijan. Another quelle surprise moment. Switzerland - 12 to Bosnia-Herzegovina. Glad to see it getting a few 12s tonight. Greece - 12 to France. Had a major chuckle here: wondered what they'd do in the absence of Cyprus. Azerbaijan take the lead now, with Ukraine in 2nd place. Serbia - 12 to Bosnia-Herzegovina. I'm shouting out the 12s before they're announced. I think Azerbaijan have won it (shrug of resignation). Latvia - 12 to Italy .Italy have been climbing steady and end in 2nd, with Sweden ending in 3rd place. Above: Ell and Nikki reprise their winning song, which (IMHO) is possibly one of the worst winning reprises ever! No, I'm not bitter about Azerbaijan winning: the Swedish-music-loving side of me should be happy that a song with such a high level of Swedish input (writers/backing singers etc) has won, and that one of the singers (Nikki) lives in Britain, but on the other hand it's just so...insubstantial, and not memorable enough to be up there with the great and the good of Eurovision. On the whole, it was a poor year but there were other songs in there which would have made better winners than this one. As recent winners go, it will probably fade fast in most people's memories, if it hasn't done so already. But on the plus side, another 'new' country has won Eurovision, and it'll be interesting to see what Baku comes up with 12 months from now. My final thoughts: Eurovision remains the great leveller. It doesn't matter if you're one of the world's top producers (RedOne, writing for Russia) or a reasonably well-known reformed boyband (Blue) or for that matter, X Factor attention-seekers extraordinaire (that's you, John & Edward) - when it comes to Eurovision, reputations go out of the window at voting time and it is still the most predictably unpredictable TV show on earth. So it's all over and 'normal service' is resumed - but time flies by so fast and it won't be long till it's starting all over again! 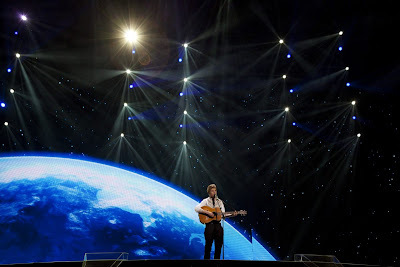 Courtesy of www.eurovision.tv , here are the results of both semi-finals which of course were not revealed until after the final, in order not to influence the voting. I had them in my top 5 possible winners, but I didn't think it would be their year this time....oh what the heck, get it over with, go to Baku next year and then normal service will be resumed. EDIT 15.05.11: The review will be posted on Monday night so check back then. I watched the second semi-final on Thursday night, not in the best of moods. I'm not sure why that was, but much of it was probably to do with my anger and frustration at the ineptitude of the BBC3 commentary team, particularly the appalling Sara Cox who in her opening seconds managed to alienate three quarters of the United Kingdom with her "Hello England..." remark. And all that talk about 'crazy European bands' and that pathetic interview technique, well I've got news for you Ms Cox, it's not Glastonbury or T in the Park. Eurovision is something unique and special, and deserves a commentator who manages to mix the humorous quips and the knowledgeable facts. Like....oh let me think....Paddy O'Connell perhaps? Whoever made the decision to replace the BBC3 semi-final commentator needs their head examined. Bosnia's Ken Bruce lookalike was a little bit shaky at times, but there was never any doubt about qualification. Austria kicked off reminiscent of Whitney Houston on "I Will Always Love You" and the result was an impressively delivered movie-ballad, although not to my taste. Netherlands: OK so they looked like a cabaret band but I still like the song. What do they have to do to qualify? 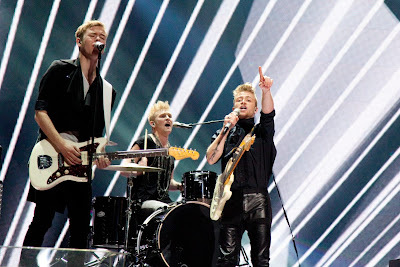 Belgium: if it's not the worst 3 minutes in ESC history, then it's right up there with whatever is. Slovakia: the twins that aren't Jedward, song wasn't too bad, and even though they didn't qualify, faithful travelling companion will always have YouTube. Ukraine: a pretty girl with a forgettable ballad, ridiculous shoulder-wings and uber-distracting Mystic Meg sand-artist. Yep that's Eurovision for ya! 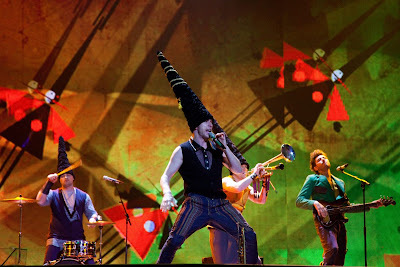 Moldova: Douze points from me for the cone hats alone. So what if everyone hates this song? It was entertaining and totally cracked me up. And then there was a girl with a cone on her head riding a unicycle and blowing a trumpet....has someone spiked my Quavers? Sweden: a nation can relax and go to bed happy in the knowledge that Eric's glass broke. Vocally ok but totally lost the vocals at times and relied too much on the backing singers. Cyprus: dramatic if forgettable song, sung by some bendy boyband types. Visually quite appealing but the song did nothing for me. Bulgaria: this was one of my favourites of the night, Bulgaria's answer to Pink and the first sighting of a Jedward-style hairdo. Macedonia: this had David Beckham as a backing dancer and the not entirely unattractive Vlatko shouting into a megaphone...more fodder for future ESC clip shows perhaps? Israel: Dana Int looked great - I loved her dress - but the song was never going to match her ESC legendary status and I expected better from her. Slovenia: this kind of Christina Aguilera style big ballad is not my type of thing at all, but I had a hunch that it would qualify. Romania: first time I heard this I thought it wasn't too bad, however on the night I really wasn't so impressed. Amateurish nonsense from a long gone era of ESC. Estonia: she's been to Katy Perry school. Not bad, but could do much, much better. Belarus: still reassuringly bonkers, but not the best idea in the world to sing at ESC about how much you love your own country! Latvia: I still like this song, but hate the outfits and their presentation of it. Denmark: over the last couple of weeks this song has really grown on me and I was well impressed. 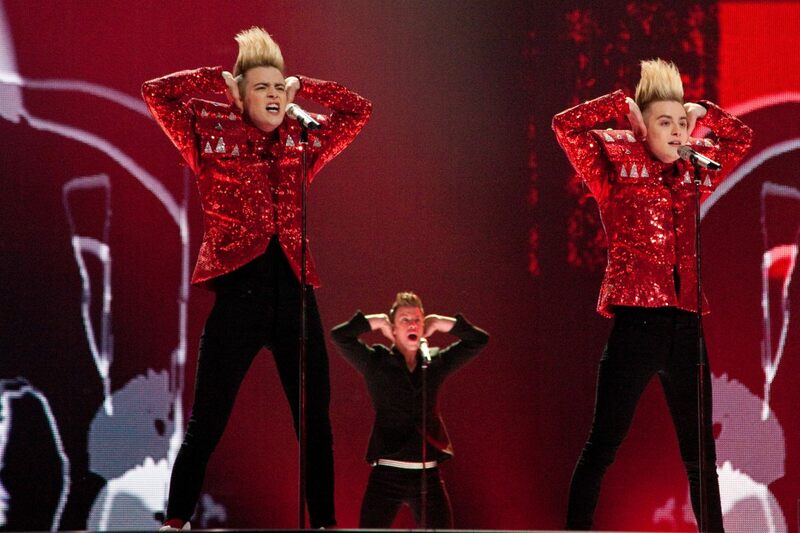 Ireland: the two headed Jed-monster strikes again. I have an eerie feeling that this is going to do very very very well indeed! Eurovision Semi-Final 1, 10.05.2011, as seen by Laura and her mum. Venue: the living room, EuropeCrazy HQ. Laura and her mum. One of these is an all-round Eurovision addict, and one isn't. M: So explain this semi-final thing to me then. L: You watch it every year. M: Do I? I don't like it. I prefer the final. These semi-finals are too long. L: Stefan Raab: he's the Jonathan Ross of German telly. M: Means nothing to me. Oh what a horrible dress that one on the left is wearing. I hope she's not going to wear that all night. L: They are all annoying me already. He's looking too smug. M: Is this ever starting? L: It's like Melodifestivalen - 15 minute intro. L: They're like Poundland Beyonce. Now get off. And she's so out of tune. L: I like this, it's good fun. But she still can't sing for toffee. M: It's not the worst. L: I hope it qualifies but....she's still so flat. And I don't like the psychedelic background. L: Total waste of time. Too shouty. M: Let me share my song with you? No thanks. Her nails were more interesting than the song. M: I could really go a cone. L: So could I. (Laura heads to the kitchen and prepares two vanilla cones, thus avoiding having to listen to the rubbishy Armenian entry). M: You never missed much. L: spends most of the song reminiscing about Turkish rock bands in ESC and going all misty-eyed about how Mor ve Ötesi didn't have to rely on any stupid gimmicks like a contortionist in a hamster ball. There were too many distractions in this one. L: They've raided the fancy dress shop for a 60s theme party. This is missing Austin Powers. L: She's quite charismatic and seems to be enjoying it though. At this point a major disagreement erupts about the merits of "Get You". L: This is my favourite song of the evening. M: It's not up to much. L: It was co-written by the most famous producer in the world today! M: I don't care, he's a good singer but with this song he doesn't have much to work with. L: Well I like it! L: This is the one with the Jason Mraz vibe. It started well but there's something I don't like about her voice, the song would have been better if someone like Colbie Caillat sang it. In fact it's a bit of a Colbie Caillat ripoff. L: They're sailing through with this one. L: That whole Within Temptation/Nightwish/Evanescence female-fronted rock band thing was always big in Europe. M: Don't like it. Too much shouting. L: Song's not particularly great but they've done it well. L: spends first minute of the song explaining how Father McKenzie's "Good Enough" should have won the Finnish national final. I jumped on that Jeff Brazier comparison before Scott Mills did, by the way. M: Someone should drop that big ball of the world on his head. Those lyrics are awful. L: Really want to punch his face now. And Scott Mills was right, he seems to have got more smug as the song went on. L: This is the gayest thing you'll see all night. M: Is it gay in a happy way? L: This is ok. Some gay old boy-pop. Won't qualify. M: Poor old Malta. They never do well. L: spends first minute of the song explaining San Marino's geographical and linguistic position. L: I'm disappointed, she doesn't have much of a voice at all for this type of song. L: spends first minute of the song explaining how the Croatian final chose the song and singer. M: there are too many women singers on this show tonight. She's all hair and legs. L: I don't like her at all. Her voice is rubbish. Oh look - costume change! M: I'd rather watch the magician guy. L: gives very brief explanation of back story. Probably for the first time tonight we both shut up and listen to the song. M: That was a nice pleasant melodic little ditty. L: Yes I still like it a lot. And it stands up well on its own even without the back story. Really hope it qualifies. M: She looks like a 58 year old man in a frock. L: I don't like this one bit, but it will qualify. M: What about the song? L: What about my ears?? M: They're like the Village People. L: This song has been on for about half an hour. M: People will struggle to find joy during this one. L: Well I'm not struggling (spends remainder of songs in hysterical giggling fit). M: This reminds me of when Eurovision was more fun. L: This is soooo musical theatre. L: English and a bit of French to grab some votes from the French speakers. Oh look, sign language now. M: This song is rubbish. Most boring song all night. M: Well this is a bit different. M: I like the breakdancing. And the guy. L: Ooh yes, I like him. Hope this qualifies so we can see him (Loukas) again. Reprise time: Mum is only favourable about Norway, Iceland and Greece; I'm also sharing the love for these, the latter for exclusively shallow reasons, especially that moment when Loukas throws his jacket open and goes into full-on Greek balladry. L: I want to go to Greece!! Oh look, there's Blue! Looking very fed up and edgy for some reason. M: "I can't, I won't, I know, I can't". Wish they'd have done something in their old style. L: Like "All Rise" or "Fly By". More interviews then it's results time! Before the show started I put an asterisk on my scoresheet against the 10 songs which I thought would qualify. As it turned out, I got 7 out of 10 right: it would appear that it's no longer enough for Armenia and Turkey to turn up, and I'm pretty gutted for Norway missing out on the final. Despite opening the voting from the beginning of the show - something which for years was denied due to the possibility of it favouring the opening songs - the first five songs tonight were completely killed by the draw. Expect the same thing to happen on Thursday, Bosnia-Herzegovina excepted of course. Delighted for Iceland and Russia though. Well done! So now it's on to semi final 2. I'll be watching it on my own - mum's chosen not to watch it, but we'll be back together again for the final! What's with Turkey's recent obsession with stupid, unnecessary gimmicks? There were no distractions when Mor ve Ötesi took to the stage in 2008, but as if the stupid drilling going on behind maNga last year wasn't enough, Yüksek Sadakat have now been lumbered with a contortionist trapped inside a ball. As you do. Pity, as otherwise this was a pretty confident performance and should be enough to qualify. Tomorrow night is of course semi-final 1 so I'll be back later tomorrow with my thoughts on that, with more rehearsal ramblings on Wednesday. In the meantime.....good luck to all the performers for the first semi-final, hope it's a great show! The Pisa Diaries, accompanied by some more gratuitous food photography (!) will be published from Sunday 15th onwards. No time for anything between now and then because....IT'S EUROVISION WEEK!! OK so this is my last blog post before I go to Pisa. This blog will be back either next Sunday or Monday at which time I'll be catching up with all the pre-Eurovision excitement! !